After record-setting predictions for new brewery openings, followed by subsequent tempered expectations after a slow spring and summer, 2018 is finishing with a flourish. As of this past weekend the number of new craft brewers stands at 23, with 16 of those boasting taprooms where flights or full pours are sold for on-premises consumption. Six have opened in just the past two weeks, including Progression Brewing in Northampton, Rustic Brewing in the Indian Orchard neighborhood of Springfield, Ground Effect Brewing in Hudson, Essex Count Brewing in Peabody, Floodwater Brewing in the Shelburne Falls village of Buckland, and Amory’s Tomb, who opened briefly earlier this year – took an extended hiatus – and re-opened recently in Maynard. Other recent debuts include Anonymous Brewing and Off The Cuff, contract brands that launched within the last month. Two other breweries, Weymouth’s Vitamin Sea and Fall River’s Troy City, have already produced commercial beer for retail, but haven’t opened their taprooms to the public yet. The 23 new breweries figure doesn’t include previously existing brands that opened their own brewery, such as Greater Good Imperials, Naukabout, or Backlash. Nor does it include the recent conversion from tasting room to taproom for Berkshire Brewing, or the opening of the new beer hall at Lord Hobo‘s brewery in Woburn. 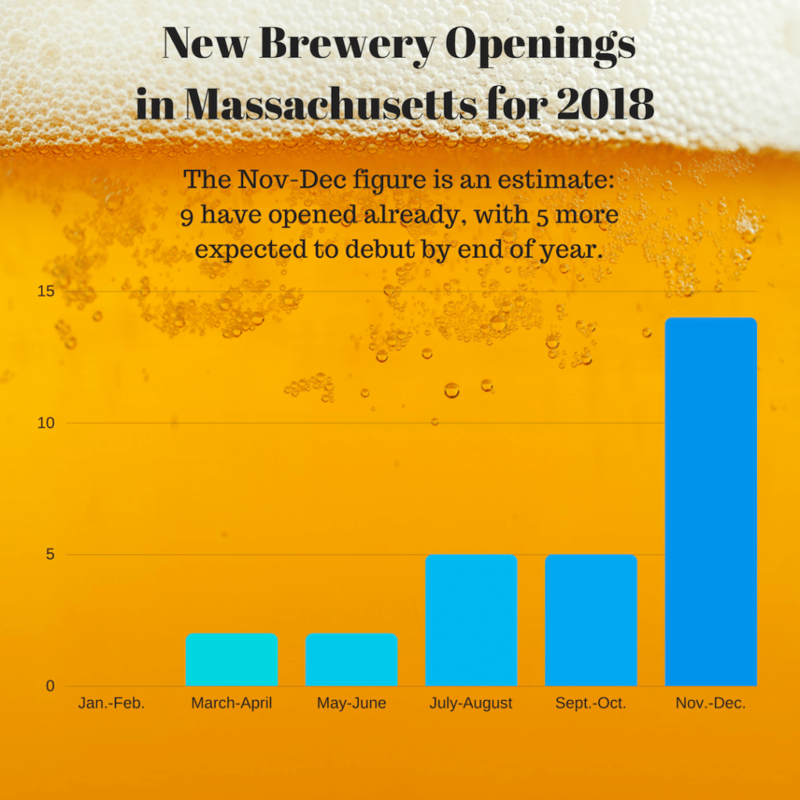 We estimate that by year’s end the brewery count in Massachusetts will surpass 180, well short of the optimistic prediction of 200 that some anticipated, though it wouldn’t be surprising to see the total reach that figure within the first quarter of 2019. We estimate that five more breweries will open before the end of the year, running the total for 2018 to 28, second only to 2017’s total of 36. Mighty Squirrel is planning a grand opening for its much anticipated Waltham facility on December 7th, Lost Towns Brewing in Hardwick recently kegged its first beer, the first retail can release for Two Weeks Notice in West Springfield is scheduled for this Saturday, and both Channel Marker in Beverly and Blazing Bandit in Ware anticipate opening by the end of the year. 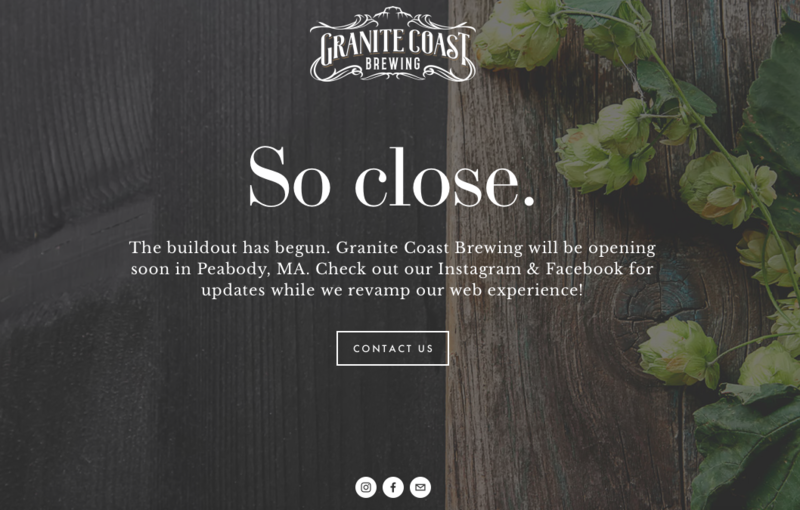 No definitive word just yet, but three others are close: Holyoke Craft Beer has test batches in the tanks, Granite Coast in Peabody is in the process of installing its brewing system, and Redemption Rock is closing in on an opening for its brewery, taproom, and cafe in Worcester. Other already-licensed entities we’re watching include Black Rabbit Farm Wild Ales in Southwick, Bruno’s Brewery at Boston Winery in Dorchester, and Sena Farm Brewery in Worthington, all of whom could open soon. 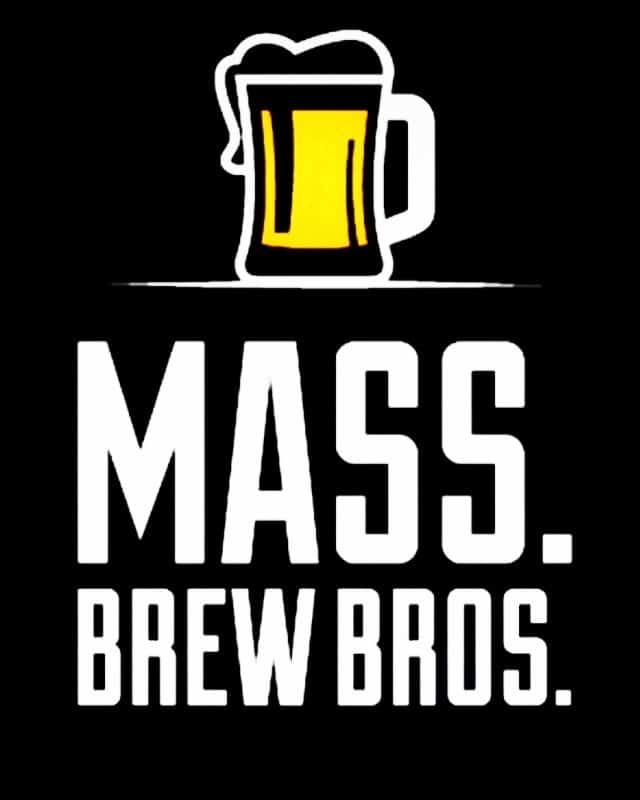 Others, including production breweries 6A Brewing in Sandwich and Henry & Fran in West Boylston plan to open their own taprooms in early 2019. Springfield’s White Lion also hopes to debut its downtown pilot brewery and taproom in the first quarter of the year. Look for Berkley Beer to open its pending brewery & taproom in Taunton during that same time frame. And Aquatic Brewing in Falmouth, Distraction Brewing in Roslindale, Fieldcrest Brewing in Wilbraham, BearMoose Brewing in Everett, and the Flying Dreams pilot brewery & taproom in Marlborough all look poised to open before spring, as do East Regiment Beer Co. in Salem, Kismet in Westfield, Leadfoot in Chicopee, Lost Shoe in Marlborough, Provincetown Brewing, and the new Night Shift location at Lovejoy Wharf on Boston’s waterfront.